KM20-22V/15, 20″or 22″ Abrasive Mitre Saw Vacuum Base is outfitted with a powerful 15HP 3PH, 220V or 440V (specify voltage) TEFC Motor. These products have application in the following industries: Energy, Oil/Natural Gas, Petro/Chemical, Knife Manufacturing, Automotive, Metal Foundries, as well as many other Manufacturing and Fabrication environments. Can cut your steel quickly. All original factory parts from this saw are replaceable no matter the age of the unit. Keeps metal dust and abrasive wheel dust down to a minimum. 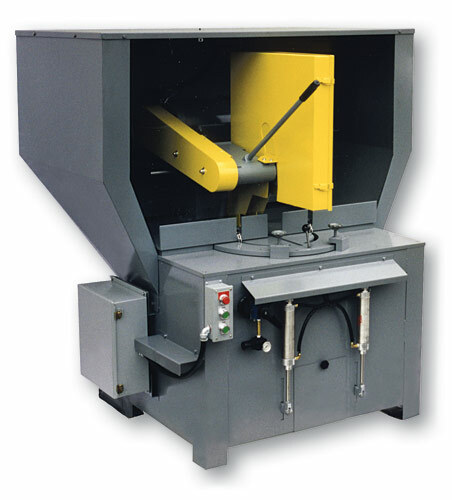 20″ Abrasive cut off saw with built in dust collector in base with hood and collection bag. 15HP, 3ph motor. Can be wired either 220V or 440V (specify at time of order). Dual air operated chain vise. 1″ spindle, sealed ball bearings. Mitres left and right 45 deg. 1200CFM dust collector with collection bag. Optional 20HP 3PH, 220V or 440V (specify voltage) motor available. Capacities: 4″ solids, 6″ most shapes. At 45 deg : 3″ solids, 5″ most shapes. Dimensions: 52″L x 63″W x 68″H , 1700 lbs. Available in 50HZ and 575V. Call for pricing!